Group under the auspices of Southern Borno Peace Initiatives for Development and Good Governance (SBPIDGG) has condemned the recent destruction of over 20 campaign vehicles mostly belonging to All Progressives Congress (APC) supporters in Hawul where the state deputy governor, Usman Durkwa hails. Legit.ng regional reporter in Borno, Ndahi Inusa, reports that the destruction was allegedly carried out during the campaign tour for the ruling All Progressives Congress (APC)'s presidential, gubernatorial and other candidates which was led by Governor Kashim Shettima. 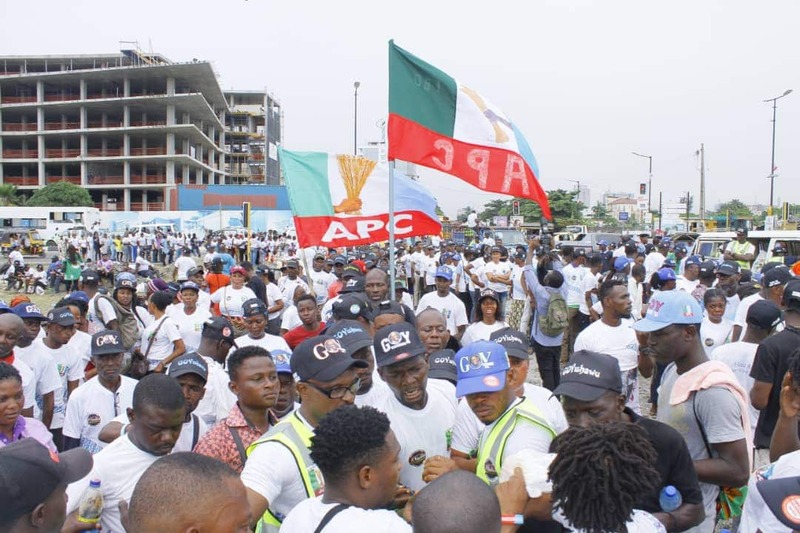 The group alleged that more than 100 thugs from Gombe state were hired by some factions of the ruling APC who stormed Hawul as advanced party and caused havoc, leaving many people with various degrees of fractured and traumatic injuries. The coordinator of the group, Mallam Mohammed Azare, who addressed journalists over the incident, said the armed thugs who invaded Hawul as advanced party ahead of the governor's convoy initially frightened many people who people thought were Boko Haram sect only to be discovered that they were hired thugs from Gombe state. Azare called on the leader of the ruling APC in the state, governor Kashim Shettima, to set up a committee of inquiry' look into the matter, and deal with those who are found wanting so as to prevent future occurrence, especially now that the general elections are fast approaching. He revealed that his group and Hawul people general who are lovers of peace and development, deem it necessary to address the press on the recent happenings within the ranks and files of the ruling APC that is now being factionalised by some selfish politicians. His words: "We members of SBPIDGG are politically inclined with the ruling APC under the leadership of governor Kashim Shettima. "We called you gentlemen of the press to intimate you on the recent attacks by thugs during the campaign tour of His Excellency, Governor Kashim Shettima and his entourage to peace-loving people of Hawul local government area, which left several people with fractured and traumatic injuries, in addition to the destruction of over 20 campaign vehicles mostly belonging to APC supporters in Hawul. "It would be recalled that Hawul local government area is the home of the serving deputy governor and his brother Alhaji Idris Mamman Durkwa who contested in the APC controversial indirect primaries that produced Professor Zulum as gubernatorial candidate, in which the governor had promised his deputy to become the running mate to whoever emerged the flag bearer of the party. "Uunfortunately, the governor did not fulfill his promise, rather than picking Alhaji Umar Usman Kadafur, a situation that created serious factions between supporters of the Deputy governor and that of his boss. "Although, the outcome of the indirect primaries that produced Zulum is still being challenged at the federal high court, we therefore called on supporters of both parties to eschew their differences for the interest of the forthcoming general elections across the state. "As one good turn deserves another, the humiliation done to Durkwa who pitched tent with the Governor at the expense of his brother, Alhaji Idris Durkwa and later abandoning him was unbecoming", Azare stated. The group governor who is the leader of the party in the state to reconsider the position of the running mate to Professor Zulum, bearing in mind, Durkwa's absolute loyalty to the ruling party and government as a whole. The group, therefore, called on the governor and the leadership of the party to tender apology to the people of Hawul who are peace loving and supporters of government policies and programmes. Meanwhile, Legit.ng had previously reported that Borno state governor, Kashim Shettima, advocated for all security and para-military agencies to get more involved in the ongoing counter-insurgency war, noting that it should not be left to the military alone.